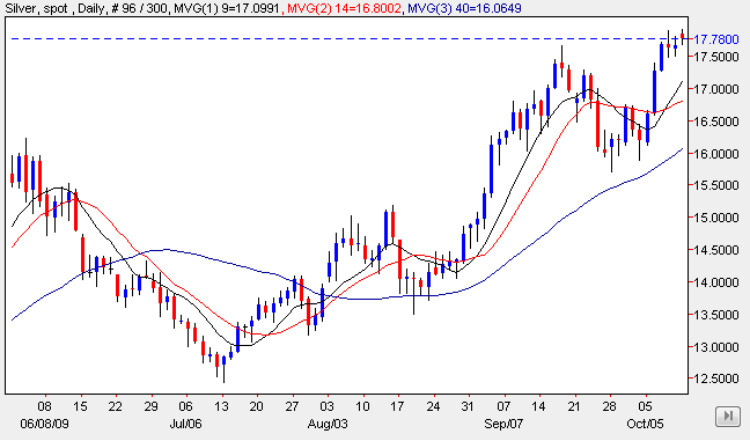 The price action on the spot silver chart was much like that of spot gold as silver prices ending their trading session as a spinning top candle on a day characterized by thin volumes owing to national holidays in both the US and Japan. With last week’s strong performance by silver, the market has now firmly broken through much of the resistance in place between the $16 and $17.50 price band with the next region sitting above in the $18.50 area. Last week’s wide spread up bar added considerable momentum to spot silver prices, and with all three moving averages pointing firmly higher and with the low of the last two weeks finding support from the 9 week moving average the upwards trend seems to be firmly established. This is coupled with the breach of the resistance outlined above and these two factors combined should be sufficient to see silver approach the $18.50 in due course.